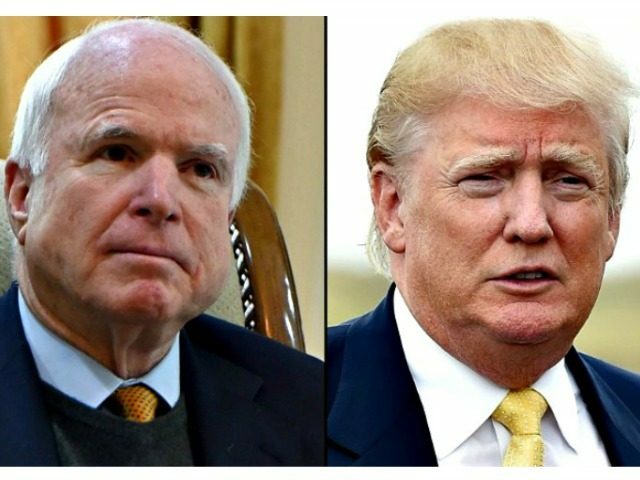 President Donald Trump explained why he did not like the late Senator John McCain, listing reasons why on Wednesday after taking the stage at an Ohio battle tank factory. John McCain received the fake and phony dossier, it was paid for by Crooked Hillary Clinton. And John McCain got it. He got it And what did he do? He didn’t call me, he turned it over to the FBI hoping to put me in jeopardy and that’s not the nicest thing to do … because I’m a very loyal person. John McCain campaigned for years to repeal Obamacare in Arizona … when he finally had the chance to do it, he voted against repeal and replace. He voted against at 2:00 in the morning, remember thumbs down? We said ‘What the hell happened?’ He said two hours before he was voting to heal and replace. Then he went thumbs down, badly hurting the Republican party badly hurting our nation and hurting many sick people who desperately wanted good, affordable health care. McCain didn’t get the job done for our great vets in the VA. And they knew it, that’s why when I had my dispute with him, I had such incredible support from the vets and from the military. The vets were on my side because I got the job done. I got choice and I got accountability. The other thing is we’re in a war in the middle east that McCain pushed so hard. He was calling Bush, President Bush all the time. ‘Get into the Middle East. Get into the Middle East,’ So now we’re into that war for $7 trillion, thousands and thousands of our people have been killed, millions of people overall. And frankly, we’re straightening it out now, but it has been a disaster for our country. We’ve have spent tremendous wealth, and tremendous lives in that war. And what do we have? It is worse than 19 years ago. I called them ‘The Endless Wars’ … John McCain loved it. “I endorsed him at his request,” Trump recalled. I gave him the kind of funeral that he wanted, which as president I had to approve. I don’t care about this. I didn’t get thank you. That’s okay. We sent him on the way, but I wasn’t a fan of John McCain. Trump tried to put the issue to rest, telling the group of workers that he was “saving time with the press” later as the issue continued to fascinate reporters in the establishment media.